Danish-South African Project Is Asking How Arts and Culture Education Can Help Reaching UN’s SDG Goals? Based on UN’s 17 SDG Goals, Danish and South African Researchers, Teachers and Artists are cooperating on a cross-sectorial educational project for schools in Cape Town and Copenhagen. The project takes place in two sequences each lasting two weeks and focuses on sustainable development exploring how nature and culture influence on each other, both north and south of the equator. In September the project is carried out in Copenhagen with classes on three different public schools in collaboration with “Open School”- Copenhagen. The project is part of the Danish Internationale Kulturpanels South Africa focus in 2017, and is a continuation of CICLO – Hood – re-imagining my future” in 2014 (http://cicloarts.net/) Danish Cultural Institute is coordinator. 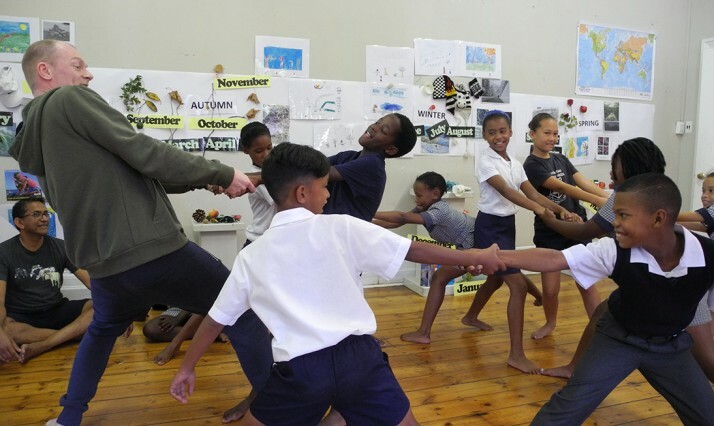 In February 2017, three Danish researchers and artists traveled to South Africa to carry out a five-day workshop for pupils in the age of 8-10 at Peter Clarke Art Centre in Cape Town. Through simple and down-to-earth exercises within dance and outdoor field work, the teachers and children created a space for reflection and dialogue about climate changes and our human footprint on the planet. Second part of the project takes place in Denmark with two guest teachers from Peter Clarke Art Centre. Public schools in Copenhagen have been offered the teaching programs through the “Open School” portal, and the teaching will be accomplished together with a 5th grade and two 8th grades at three different schools: Peder Lykke Skolen, Amager; Kildevældsskolen, Østerbro and Hanssted Skole, Valby. The program is interdisciplinary, focusing on culture and nature through practical exercises and talks about experiencing seasons and the elements of nature. The Danish children will focus on dance, design and art, just like the children in Cape Town in February. The 5th grade will explore dancing and movements (this project is entitled “Red Apples. Green Apples”), while the 8th grades will devote themselves to sustainable design and architecture. The aim of the teaching programs is that the students will gain knowledge on how to consider expressions, functions and space in design and choreography. Having knowledge about how to design and build with existing resources can encourage reflections on sustainable development and open a door for the students to how one can work with design solutions, that might solve challenges caused by climate changes. E.g. too little or too much water, which is one of the issues in the teaching program and a current challenge in both South Africa and Denmark. The pedagogical experiences from the tuitions will become part of a common research project between universities in Copenhagen and Cape Town. One of Peter Clarke Art Centre’s main tasks is to facilitate training programs for teachers at public schools in the many townships of Cape Town, and the experiences from the South African-Danish project will go into these programs. In Denmark the vision is to contribute to goals about ”The Open School”. The CICLO project is a cross-disciplinary collaboration between players in Denmark and internationally. It was initiated in 2011 and focuses in knowledge exchange and Arts and Culture Education. The outset of the project was the UNESCO’s Seoul Agenda in 2010, that gave future guidelines and standards for Arts Education. Today the purpose of the CICLO project is to develop education and teaching methods, that relate to UN’s 17 SDG Goals and the cultural dimension. ”Red Apples, Green Apples” is closely connected with a collaboration initiated by Associate Professor Karen Vedel, between Copenhagen University and University of Cape Town as part of the North-South research network ”Knowledge Production, Archives and Artistic Research”. By Fanny Victoria Andersen and Malene K. Holm, DCI.